In September, DC Water and Sewer Authority (DC Water), Calvert Foundation, and Goldman Sachs announced the nation’s first Environmental Impact Bond to fund green infrastructure to manage stormwater runoff in Washington DC. This first Environmental Impact Bond occurs three years after the publication of the CASE i3 working paper, “Environmental Impact Bonds,” written by CASE i3 MBA student David Nicola and edited by CASE i3 Director Cathy Clark. Beth Bafford and Jacqueline Westley, CASE i3 MBA alumni and members of the Investments Team at Calvert Foundation, were instrumental in forming the DC Water Environmental Impact Bond. We chatted with Beth to find out more about this first Environmental Impact Bond and get her thoughts on the future of Environmental Impact Bonds. CASE i3: Let’s start with the basics – what is an Environmental Impact Bond? How is an Environmental Impact Bond different from a green bond, which people may be more familiar with? Beth Bafford: The Environmental Impact Bond came from the Social Impact Bond terminology started in the UK. Despite the name, Social Impact Bonds (or SIBs) are not usually actual bonds, instead they are contracts between the parties involved. The first SIB attempted to shift how we think about paying for social services by creating outcomes-based contracts with investors engaged in taking on execution risk usually absorbed by governments in exchange for the promise of earning returns if outcomes are achieved. Since then, SIBs (also called pay-for-success contracts) have spread across the globe as governments, social service providers, and investors attempt to align incentives to achieve positive social outcomes. The DC Water Environmental Impact Bond is similar to a SIB in that it is a contract between parties that says a portion of the repayment to investors will be based on the outcomes of an intervention – in this case the efficacy of green infrastructure in reducing stormwater runoff. But this Environmental Impact Bond differs from a SIB in a few ways. One, it is an actual bond issued by DC Water. As a tax-free bond, it functions as a debt security issued to finance capital expenditures and backed by DC Water with regular payments of interest and full repayment of principal at the end of the term. Two, it is financing environmental outcomes instead of social outcomes (like education, juvenile justice, etc.). And three, unlike some SIBs that are financing an intervention through projected cost savings, this was structured to incentivize innovation by sharing risk between the payor (DC Water) and the private investors, all with the goal of allowing DC Water to test an innovative and potentially more cost-effective way to reduce stormwater runoff. Can you provide detail on the structure of the DC Water Environmental Impact Bond, including impact metrics in terms anyone can understand? 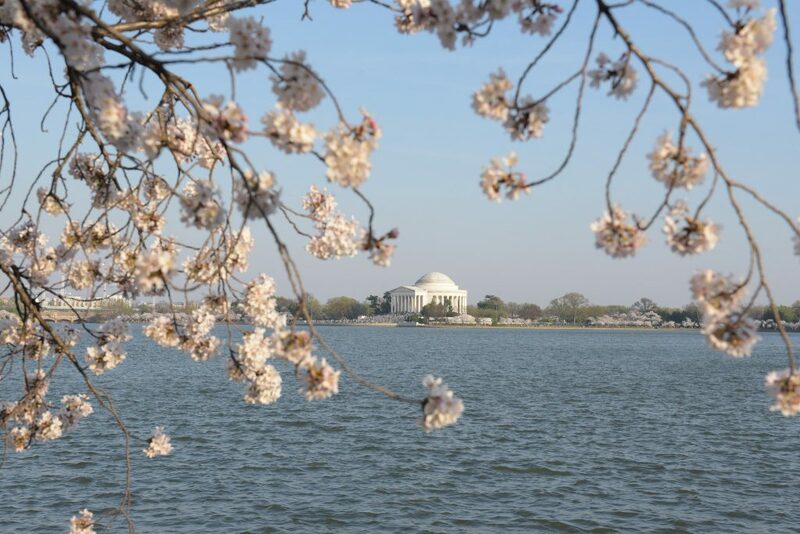 The DC Water Environmental Impact Bond is a tax-exempt bond issuance where a portion of the payment to investors is dependent on the outcomes of the intervention. DC Water will be installing and testing green infrastructure designed to reduce stormwater runoff into DC’s sewer system. The idea is that the acres of new green space will absorb stormwater, which will reduce the flow of stormwater into the existing sewer system. Reducing stormwater flow into DC sewers is impactful because when the system receives too much stormwater and overflows, a combination of the stormwater and sewage bypasses treatment plants and goes straight into the Potomac and other waterways, causing major water quality and environmental issues for local residents. DC Water could build a new pipe system to fix this problem, but that would be costly, time-consuming, and more disruptive to local residents. If the green infrastructure works at this scale to reduce stormwater runoff, it will be a less expensive and more environmentally attractive solution. So the Environmental Impact Bond was structured to test an innovative and possibly dramatically better way to treat this stormwater flow problem. Stormwater runoff reduction (measured in million gallons per average year per impervious acre) will be measured at two points in the 5 year plan (see the chart below), once to create a baseline and a second time to evaluate the intervention. If runoff flow is reduced as expected, DC Water will pay full principal to investors at maturity. 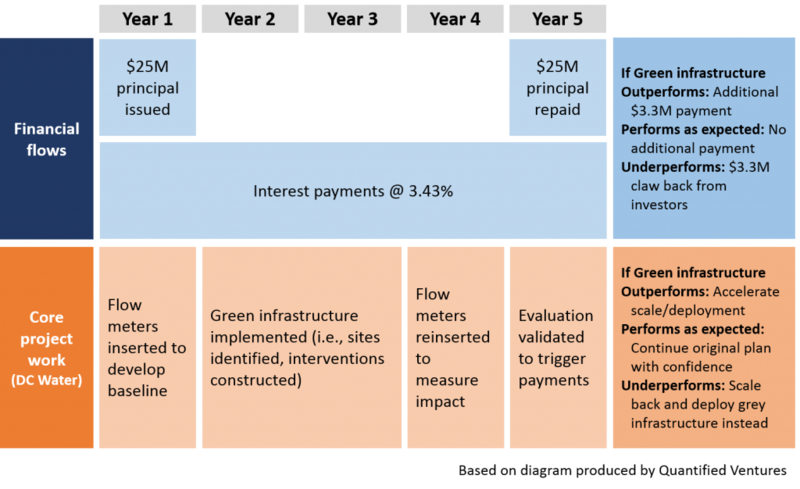 If runoff reduction outperforms (the green infrastructure is more effective than expected), DC Water will pay investors a bonus “outcome payment.” If runoff reduction underperforms, investors will pay a “risk sharing payment,” meaning they will have a lower effective return from the investment. This range of outcome payments is very similar to the payment options Dave Nicola laid out in his CASE i3 paper three years ago. Who are the investors and what are they expecting from the bond in terms of return? The investors are Calvert Foundation and Goldman Sachs. The expected return under the base case is 3.43%. If the experiment outperforms, the investors will get an additional $3.3 million, bringing our potential return to around 6.4%. If green infrastructure is deemed to be successful, DC water will work to scale up implementation across the District. If the experiment underperforms, investors will net $3.3 million from their final principal payment, reducing the effective return to 0.5%. If this is the case, DC water will likely stop all future green infrastructure projects and continue investing in grey infrastructure (tunnels). Tell us a bit more about the different stakeholders that came together to make this work – what were the different motivations and constraints of different parties? The investors (including us at Calvert Foundation) were seeking ways to leverage private capital to promote innovation for greater social and environmental impact. To do so, we were willing to share risk with DC Water so they felt comfortable financing a more innovative approach to stormwater management that has many positive social and environmental externalities, such as improved air and water quality, reduction of urban heat island effects, and creation of local, quality jobs [see footnote below]. DC Water worked closely with the Water Environment Federation to create a job training and certification program for Green Infrastructure construction and maintenance and has pledged to hire at least 51% of their workers from the DC community. DC Water was interested in testing green infrastructure but has a mandate to make the best financial decisions on behalf of its rate payers. Their ability to offload the downside risk to investors like Calvert Foundation was important so they were able to test this promising but unproven approach. We also had support from Quantified Ventures, the transaction coordinator, and the Harvard Government Performance Lab, the technical advisor, who were both excited to see pay-for-success models translated in the environmental space. The 2013 CASE i3 working paper “Environmental Impact Bonds” explains, “The political and regulatory environment is a potential risk for the establishment of SIB/Environmental Impact Bond structures and is consistently cited as a potential obstacle for widespread adoption of these structures.” Did political or regulatory risk come into play at all in the process of creating the DC Water Environmental Impact Bond? We did not face much political or regulatory risk in the creation of the Environmental Impact Bond because the “payor” (the organization paying for outcomes), DC Water, is not an agency of the DC government. The political or regulatory risk in SIB structures tends to arise when there is legislation necessary for the government to sign the pay for success contract or where there are real or perceived risks from shifting existing funds to make room for the outcome payments. Neither were true in our case. Why did it take so long for someone to develop the first Environmental Impact Bond? As mentioned in the CASE i3 working paper, “For social issues, the government is the primary source of payments and there are rarely any “natural” revenue streams. For the environment and conservation, many natural resources have been linked to regularly occurring revenue streams.” Based on this insight, it would seem like an Environmental Impact Bond would be easier to put together than a SIB, yet we’ve had a number of SIBs in US and this is the first Environmental Impact Bond. That’s a great question! I think the paper is right that impact bonds in the environmental space are a bit more straightforward and easy to measure, but the founding organizations in the SIB space have been more focused on social metrics and services due to the first examples of their use. Note also that the metric for this project is not gallons of clean water, it is gallons of reduced runoff. As Dave noted in his paper, environmental science is such that we can often use outcome proxies with greater confidence. In this case, if the runoff is reduced we know that the water will be cleaner. We expect (and hope!) that there will be many more Environmental Impact Bonds moving forward. Prepare for drought by infiltrating water where it falls. Green infrastructure can help replenish groundwater reserves, relieving stress on local water supplies and reducing the need to import potable water. Manage flooding with infiltration-based practices, floodplain management, and open space preservation to complement other measures to lower flood risk. Reduce urban heat island effect by planting trees and building green roofs. Lower building energy demands by reducing indoor temperatures and shading building surfaces. Spend less energy managing water by reducing rainwater flows into sewer systems. Green infrastructure can reduce pumping and treatment demands for municipalities.